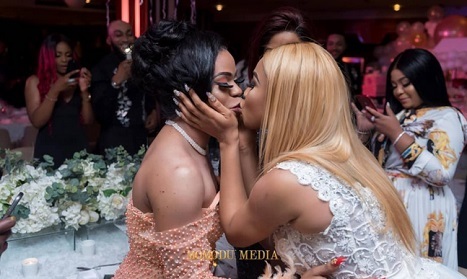 Bobrisky was a guest at Tonto’s 33rd birthday over the weekend, infact he literally spent the weekend with her alongside another of his bestie – Toyin Abraham. Tonto Dikeh’s official birthday photos as just been released and the two were caught on camera locking lips. Worthy of note: The duo have one time (different times) been best pals with Toyin Lawani, but at the moment, they don’t talk to her. No, it’s not a joint thing, they both fought with Toyin at different times. And well… nature just brought these two together – nothing about Toyin!